UPS tentative agreement: Bogus and insulting raises for part-timers | Fight Back! 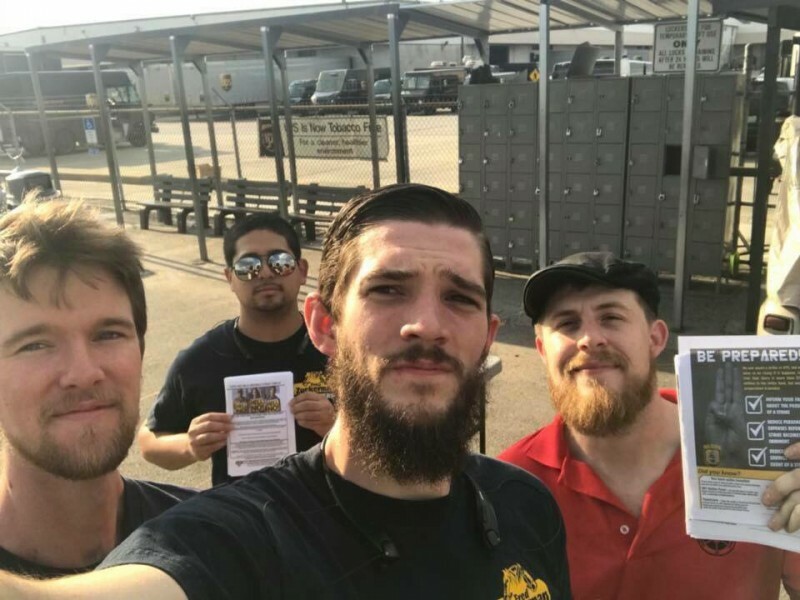 Jacksonville, FL - On June 21, the Teamsters announced reaching a tentative agreement ‘in principle’ with UPS. Headed by Teamsters Package Division director Denis Taylor, the union’s committee unveiled “highlights from the economics in the agreement” after months of closed-door bargaining. The full tentative agreement will not become public until the remaining regional supplements and local riders conclude bargaining. But while we’re still waiting to see the full tentative agreement, the details we have seen look awful – full of concessions on job standards, wages and more. At the start of bargaining, the Teamsters negotiating committee brought an impressive set of contract proposals to the table, submitted by UPS Teamsters across the country, which would have addressed our issues as full-timers and part-timers. Months later, we have a tentative agreement that falls short on many issues (wages, harassment and 9.5 protections for drivers) and sells us out completely on others (two-tier hybrid drivers). Speaking as a UPS part-timer and union steward myself, I see nothing in this tentative agreement for part-timers to support – and plenty to oppose. UPS Teamsters will have a chance to see the entire tentative agreement before voting on it, as they should. But if this is what we have to expect, we need to vote this rat deal down and demand better. Last year, UPS made record profits totaling $4.9 billion. In addition, the company made an estimated $1 billion from the tax cuts passed by the Republican-dominated Congress and signed into law by President Donald Trump. Remember that profits are not revenue. Profits are the remainder of the company’s revenue after expenses – wages, pension and health insurance payments, repairs, operating costs, etc. That money goes toward Wall Street, shareholders, and corporate buybacks, even though our labor as UPS Teamsters created it. Part-timers, who make up an estimated 70% of the workforce, play a critical role in generating this profit, and yet we receive the lowest wages. The starting rate for part-timers under the current contract is $10 per hour with a daily guarantee of just 3.5 hours. In the first year of employment, part-timers have no health insurance. And despite promises by UPS to create new 22.3 full-time jobs in the warehouse, most part-timers grind out a life at UPS marked with poverty wages and too few hours. With UPS on-track to have their most profitable year yet in 2018 – over $6 billion – it’s plainly obvious that the company has more than enough money to meet part-timers’ demands for a living wage and more full-time warehouse jobs. But like every corporation, they want to keep as much profit for Wall Street, their shareholders and themselves as possible. The tentative agreement reflects this reality. The tentative agreement falls very short of the $15 per hour starting wage and the $5 per hour catch-up raises demanded by UPS part-timers. According to Taylor’s negotiating committee, the tentative agreement proposes a $13 per hour starting wage for part-timers. This starting rate will supposedly increase each year and reach $15.50 on August 1, 2022 – four years later. According to current inflation projections, $15.50 in 2022 will equate to just $14 in 2018, making this raise illusory at best. For current UPS part-timers, the tentative agreement is even worse. It includes no catch-up increases for UPS Teamsters with seniority. Instead, existing part-timers will only receive the same “General Wage Increases” as everyone else: $4.15 spread out over the five years of the contract. The starting wage should increase – by a lot more than the tentative agreement proposes – but those of us who have struggled for years making part-time poverty wages deserve better. We cobbled together two, three and even four jobs to care for our families and grind out an existence at UPS. Raising the starting wage for new hires without giving equivalent catch-up raises to current part-timers is a slap in the face to every hardworking UPS Teamster. The Teamsters’ original demand - $15 per hour as the new starting rate in 2018, with $5 per hour catch-up raises for existing part-timers – is not impossible or too expensive for a company that made almost $6 billion in profits last year. They made that wealth from our labor, and we deserve so much better than the insulting, disrespectful schemes offered in the tentative agreement. The tentative agreement is so bad for part-timers that Taylor’s negotiating committee has to twist the truth to claim any victories at all. In their announcement, the committee boasts that the tentative agreement will eliminate the absurd four-year wage progression for part-timers – something the union should have never agreed to in the first place. Under the 2013-2018 contract, new part-timers received raises totaling just $2.50 over four years, compared to the $3.90 raises received by existing part-timers. It was a miserable two-tier system that – speaking from experience – unfairly deprived new part-timers of a living wage. But the tentative agreement just rebrands the four-year part-time progression as “starting rate increases.” Each year, the new starting rate of $13 per hour would increase until reaching $15.50 on August 1, 2022 – four years later. Wages for new part-timers will keep pace with the starting rate since the “General Wage Increases” will not apply to them. The end result is $2.50 in raises over four years – the same $2.50 in the current four-year part-time progression. We absolutely should eliminate the four-year part-time progression for the same reason we should oppose the company’s two-tier hybrid driver scheme. It means less money in the pockets of UPS Teamsters doing the same type of work, it hurts solidarity among coworkers, and it weakens the union. But the tentative agreement doesn’t do this – it just re-brands two-tier part-time progression by tying raises to the starting rate. Taylor wants to market this tentative agreement to newer, lower seniority part-timers. Under the agreement, any current part-timers making less than $13 per hour would receive a bump to the new starting rate or a $0.70 raise – whichever is higher. But this very modest wage bump masks a greater disrespect: Current part-timers with three years of seniority or less will now make the same rate as a new hire. A part-timer with four years of seniority ($12.50) will receive a $0.70 raise, meaning they will make just $0.20 more than someone hired August 1, 2018. For Preloaders and Sorters, the problem is even more severe. Under the current agreement, Preloaders and Sorters received an extra $1 for working ‘skilled’ positions, starting at $11 per hour instead of $10. The tentative agreement eliminates the extra $1 per hour paid to Preloaders and Sorters, who will now start at the same general rate of $13 per hour. Preloaders and Sorters with three years of seniority or more already make at least $13 per hour, meaning they will receive no bump at all to the new starting rate. For those with less than three years of seniority, their bump to the new starting rate of $13 will be even less than for part-timers in general, owing to the extra dollar they already make. After all, the path from $11 to $13 versus $10 to $13 is a lot shorter. It gets back to the problem of no catch-up raises. Part-timers with higher seniority are actually punished by a decline in their wages relative to new hires. The tentative agreement degrades the entire principle of seniority as it relates to our wages. One of the major victories won during the 1997 UPS Teamsters strike was the creation of 22.3 full-time warehouse jobs (also called ‘combo’ jobs). UPS agreed to create full-time positions in the warehouse by combining two part-time jobs into a full-time job, with all of the raises and better benefits that come with it. In the last contract, UPS pledged to create 10,000 new 22.3 combo jobs. By all accounts, they fell short of their pledge. The company never wanted to create full-time warehouse jobs. They want a majority part-time workforce to whom they can pay poverty wages. Under the tentative agreement, UPS wants their two-tier hybrid drivers (so-called 22.4 positions) to count towards their pledge to create more 22.3 full-time warehouse jobs. These hybrid drivers, who will do the same work as a package car driver but get paid between $6 and $16 less, hurt part-timers as well as full-timers. If hybrid drivers count towards their obligation to create 22.3 positions, the company has no incentive to ever create another full-time warehouse job again. They prefer instead to create a lower paid fleet of second-tier drivers. Taylor and UPS want to market the hybrid driver position as a handout to part-timers looking for full-time jobs. Does he think we’re stupid? 22.3 full-time warehouse jobs have higher wages and better benefits than part-time warehouse jobs for the same work – an improvement. Hybrid drivers would have lower wages and worse conditions than current package car drivers for the same work – a sharp decline. Part-timers: Vote no on bogus & insulting raises. Fight back! The tentative agreement looks like bad news for UPS part-timers. It’s full of weak raises, re-branded poverty progression, insults to our seniority and deep concessions on full-time jobs. Most of all, it falls short of the union’s initial proposals, which the 230,000 workers covered by the UPS-Teamsters contract supported. Last month, 93.18% of UPS Teamsters voted to give the international union strike authorization. Taylor told us the authorization would give the union more leverage at the bargaining table to come back with a better tentative agreement. We gave him a credible strike threat. He gave us this rat deal. Our labor built this company. We have a tremendous amount of leverage over UPS. We should demand our union leaders use it and deliver the contract that our families and us deserve. Dave Schneider is a UPS Teamster, a part-timer, and an elected shop steward for Teamsters Local 512 out of Jacksonville, Florida.